Providing Ford diesel service customers can count on RPM Automotive Services. With the torque and power that diesels produce it’s no wonder why many fleet and RV vehicle owners seem to be opting for diesel trucks these days. Diesel repair can be complicated, It does require skilled training and a trained eye. You can’t go into the project thinking it’s like a regular spark-ignition engine. 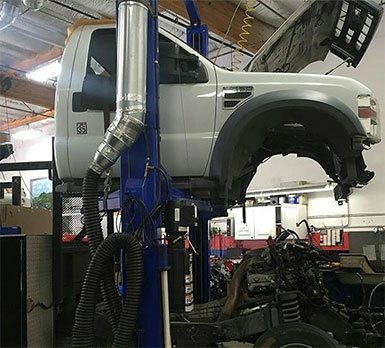 Here at RPM Automotive Services, we’ve made ourselves the experts in Ford PowerStroke diesel repair. We strive to provide the best quality work available and because of this, we are known for being one of the best in Northern California. Since 1982 RPM Automotive Services has been dedicated to offering the best auto repair and Machine Shop services. As a complete automotive service facility, there is never a job that is too big or too small for us to complete and we offer competitive pricing to ensure you’re getting the best value for your dollar. We are able to service not only your daily driver but your fleet and equipment as well. Our technicians are the best in the business and this allows us to the ability to offer one the best warranties in the industry. We have been Diamond Certified since 2001 and ASE Certified as well. Contact RPM Automotive Services for your first choice for all things related to your Ford Diesel in the Rohnert Park area.